Stengel was referring to Jim Hegan, the Indians’ longtime catcher, who had a reputation for excellent defense. 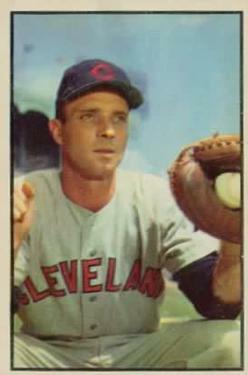 Hegan’s catching prowess and game-calling ability helped the Tribe have one of the game’s most dominant pitching staffs from 1947 to 1956. Beyond his success on the field, Hegan was one of the Indians’ most popular players, among both his teammates and the Cleveland fans. He spent 14 of his 17 major-league seasons with the Indians and never lacked for job security despite a career batting average of just .228. James Edward Hegan was born on August 3, 1920, in Lynn, Massachusetts, a few miles north of Boston, to John and Laura Hegan, a working-class Irish couple. His father was a policeman. Family was the focal point of the Hegans’ lives. John sang in a barbershop quartet, and any time they were all together after dinner, they would gather to sing in the living room. Emphasis on family and an affinity for barbershop quartets remained with Jim for the rest of his life. The Hegan family – Jim had two sisters and four brothers – also possessed a substantial amount of athletic ability. Jim’s youngest brother, Larry, played basketball and pitched for his high-school baseball team despite having a deformed hand. His oldest brother, Ray, was a very good football player and received a scholarship to Dartmouth.2 Jim starred in baseball, basketball, and football in high school. He was the only one in his family to play a sport professionally. Hegan met his future wife, Clare, at Lynn English High School. He was a senior and she was a sophomore. It took little time for them to realize that they wanted to get married, and they were wed in 1941. Jim and Clare had three children, Mike, Patrick, and Catharine. Mike was the oldest, born in 1942, seven years before his brother, Patrick, and 12 years before his sister, Cathy. Mike played for three teams during a 15-year playing career before becoming known to another generation of Indians fans as a TV and radio broadcaster for Indians games. Like most young families, the Hegans had to work hard to make ends meet. Before moving from Boston to Cleveland, the family shared a house with Clare’s sister, across the street from Clare’s parents. Hegan broke into professional baseball in 1938, when the Indians offered him a contract at the age of 17.5 He played in the minor leagues with Springfield of the Class C Middle Atlantic League in 1938 and 1939, and split the 1940 season between Oklahoma City of the Texas League and Wilkes-Barre of the Eastern League. He played for the same two teams in 1941, and was promoted to the Indians in September. His debut with Cleveland, on September 9 against the Philadelphia Athletics, must have been a daunting event for Hegan; he was assigned to catch Bob Feller. But the rookie went 2-for-5 with a home run and drove in three runs, and the Indians won, 13-7, as future Hall of Famer Feller earned his 23rd victory of the season. Hegan’s debut was a sign of a promising career to come, although the realization of that career took some time. In 1942 he played in 68 games and batted only .194 in 170 at-bats as Otto Denning and Gene Desautels handled the bulk of the catching. With the US fighting in World War II, Hegan was away serving in the Coast Guard from 1943 through 1945. He returned to the Indians in 1946 and batted .236 in 271 at-bats while splitting the catching duties with Sherm Lollar and Frankie Hayes. The most spectacular pitching staff during Hegan’s tenure, of course, was the one from the 1954 team. That year, the Indians led the American League with a sparkling 2.78 ERA. With such a dominant staff leading the way to a 111-win season, losing the World Series in a four-game sweep to the Giants was hard to take, particularly for Jim. Hegan made several noteworthy headlines during the 1954 season. One memorable day was September 12, when the Indians swept a doubleheader against the Yankees before a crowd of 86,563 at Cleveland Stadium. Hegan caught both games, a complete-game 4-1 victory for Bob Lemon and a complete-game 3-2 victory for Early Wynn. Six days later he hit a solo home run for what turned out to be the deciding run in the pennant-clinching victory in Detroit. The headlines weren’t as favorable in Game One of the World Series against the Giants at the Polo Grounds in New York. In the eighth inning, with the score tied at 2-2 and two Indians on base, Willie Mays made his famous catch of Vic Wertz’s long drive to center. Most people say the catch took the wind out of the Indians’ sails. In reality, the Indians had a better chance to score three batters later, but the wind literally ruined their chance to score. Hegan came to bat with the bases loaded and two outs and hit a long fly to left, but the wind knocked down what might have been a grand slam. The same wind didn’t do the Indians any favors in the bottom of the tenth, when Dusty Rhodes’ short fly ball stayed fair down the right-field line for a three-run homer, giving the Giants a 5-2 victory and setting the stage for their sweep. That 1954 season was one of Hegan’s best. He batted only .234 but hit 11 home runs and a career-high seven triples, and led American League catchers in fielding percentage (.994). He repeated the feat in 1955 (.997) while committing only two errors. Hegan was popular with his teammates too. Often they would join him in barbershop quartets on train rides during road trips. Hall of Fame pitcher Bob Lemon was his roommate and best friend. They roomed together for 17 years, starting in the minor leagues when they were both 18. The two were complete opposites. Lemon was an avid socializer who loved to crack jokes and often came in late after having a few too many. Hegan was more reserved and was one of the few players who didn’t drink. “I was able to watch him in action and operate,” Mike said. “He was really Ralph Houk’s right-hand man. Everywhere Ralph went, he went. I would call him an assistant pitching coach more than anything else. That’s basically what he was. Fortunately for Cleveland fans and Tribe pitchers, Jim Hegan loved baseball and perfected the art of catching. He continues to be and always will be remembered as one of the greatest and classiest players ever to wear a Cleveland Indians uniform. 1. Hal Lebovitz, “Trade will help Cavaliers – if Turpin has heart,” Cleveland Plain Dealer, June 20, 1984. 2. Interview with Mike Hegan, August 12, 2009. 3. Thanks to Mike Hegan for supplying much of the information regarding Jim’s family background. 4. All additional quotations from Mike Hegan come from the 2009 interview. 5. Hal Lebovitz, “Hegan has gone, but leaves us memories of a truly class act,” Cleveland Plain Dealer, June 19, 1984, 1-D.
7. Cleveland Plain Dealer, September 10, 1941. 8. Lebovitz, “Hegan has gone,” 3-D.
9. Associated Press, “Veeck Contemplates Few Changes In Indians’ Squad for 1949 Season,” New York Times, October 15, 1948, 29. 11. Joe Wancho, “Mike Hegan,” The Baseball Biography Project, available at http://bioproj.sabr.org/bioproj.cfm?a=v&v=l&bid=1681&pid=6068. 12. Louis Effrat, “Cleveland Contends Wind Contributed to Downfall at Two Important Points, New York Times, September 30, 1954, 41. 13. Lebovitz, “Hegan has gone,” 3-D.
14. Lebovitz, “Hegan has gone,” 1-D.
15. Bob Dolgan, Heroes, Scamps and Good Guys (Cleveland: Gray & Company, 2003),, 35. 16. Al Doyle, “Sustaining a Long Career: Despite weak hitting abilities, some catchers make an impact in the major leagues strictly on their defensive expertise,” Baseball Digest, October 1996, 57. 17. John Drebinger, “Fisher in 7-hitter,” New York Times, September 4, 1960, 129. 20. Lebovitz, “Hegan has gone,” 3-D.
22. Dolgan, Heroes, Scamps and Good Guys, 34.